The Inner Sea is the heart of the Pathfinder campaign setting. From devil-worshipping Cheliax to cosmopolitan Absalom, the savage and frozen Lands of the Linnorm Kings to the steaming jungles of the Mwangi Expanse, there's a place for any character or adventure your imagination can come up with. Yet while a Game Master or player might know all the secrets of the setting, courtesy of the Pathfinder Campaign Setting World Guide: The Inner Sea, what does a character know about his or her world? 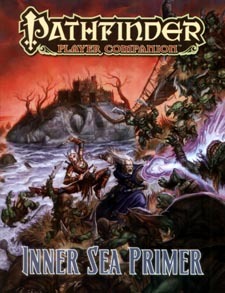 With the Inner Sea Primer, Game Masters can quickly and easily introduce their players to the Pathfinder campaign setting, and experienced players can customize their characters with new, setting-specific tricks and traits. New character traits for every country and region, helping to flesh out characters and tie their backgrounds and mechanics into the setting. New archetypes for three Inner Sea sword fighting styles: the Aldori swordlord, the Qadiran dervish, and the Taldan rondelero duelist. Three new arcane schools: the item crafters of the Arcanamirium, Egrian's infernal binders, and the stealthy illusionists of Osirion's mages of the veil. This Pathfinder Player Companion works best with the Pathfinder Roleplaying Game or the 3.5 version of the world's oldest fantasy roleplaying game, but can be easily incorporated into any fantasy world.